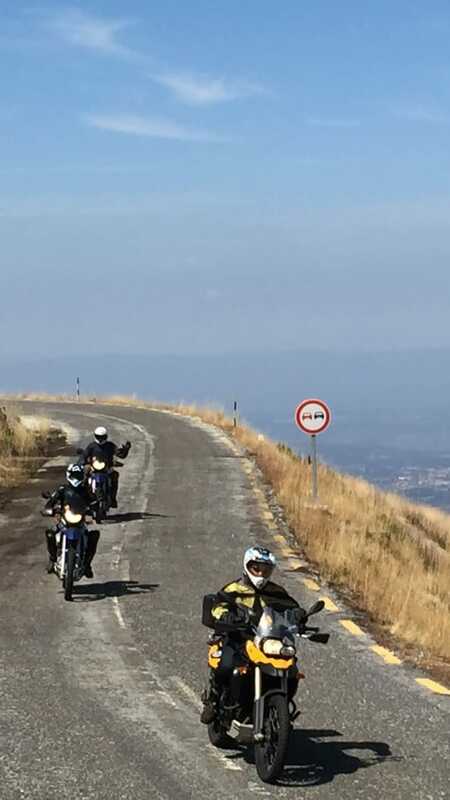 Mix it up with mountain on road/off road experience, awesome roads climbing to a 2000 meter height in the national park thousands of unspoilt roads, breathtaking views with kilometres of forest tracks, valleys. river crossings and medieval stone villages. 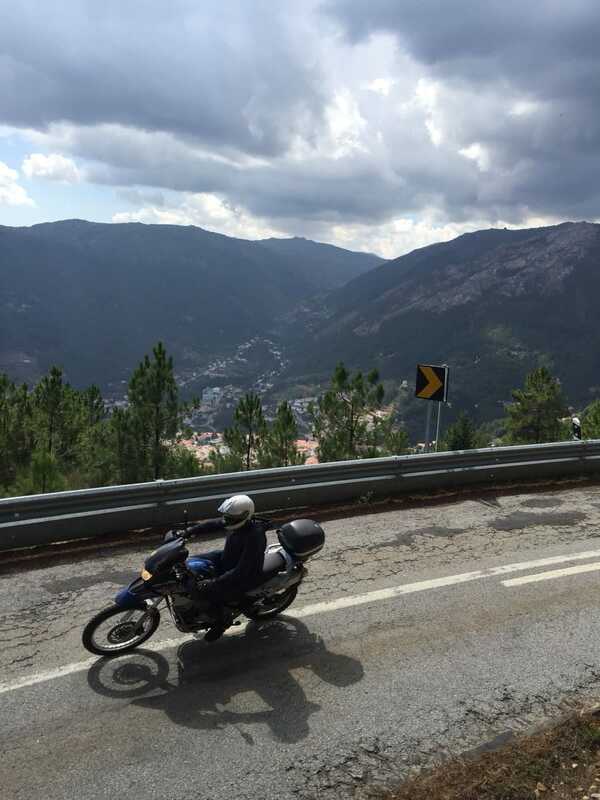 Just finished Day 5 of my motorcycle week – up to the mountains... the icing on the cake! This is my third visit to Casa da Roda. The first two were in 2008 and included an introducing to off road riding and a trip to Estoril to watch the MotoGP, plus lots of good riding on the local roads. I cannot say enough about Geoff's patience and skill, especially this time, dealing with someone who had broken their shoulder exactly a year ago, two days before I was due here for a motorcycle week, which I had to postpone. So... not having been on a bike for 18 months, not having ridden here for several years and being “that much older”.... Geoff had me get my sea legs on his Kawasaki 100 – Aagh! But it turned out to be a lot of fun. On Day 3 having graduated to the BMW650, we went to Aveiro. A Bank Holiday Monday, the weather was excellent and more traffic on roads. Me? Well.... not so good, as I had felt challenged right off the bat not being able to touch the ground. Geoff was great at planning accordingly and I and the bike made it home in one piece. However, we both figured “that was it” for my riding the 650. 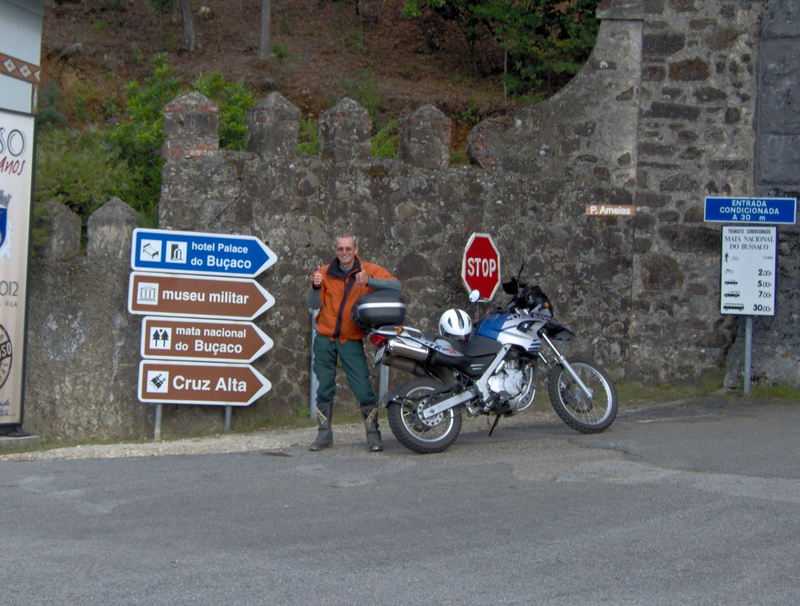 On Day 4 I pillioned on the back of Geoff's FS800 to Caramulo. Another lovely day of sun and very relaxing for me on the back. Then.... surprise, surprise..... after we got home Geoff “softened” the 650 suspension and I was able to touch the ground. So.... Day 5 just completed – (Smiley Face!) - I was so much more comfortable and had my confidence back. THANKS to Geoff – smiling in my helmet – Woo Hoo!! Still one more day to pack and relax, have a wander around the Thursday market in Arganil. It would be easy to “ditto” all the superlative comments in the guest book already. I agree, I find them also so true. This was my second time at the villa/motorcycle week and the weather conspired to make it “different” to my first stay. Different, but no less enjoyable, thanks to you both. Like the magician you are Geoff, you kept pulling rabbits from the hat of local entertainment, ie. Swimming, saunas, etc. The ability to turn a damp day into a bright entertaining day is a special skill which I think you both have. Like Arnold..... “I'll be back”! Thanks for a fabulous week- our third visit to this beautiful villa, with stunning views and great biking- on road and off road! Geoff and Lin are such good hosts and made sure we were well looked after. The biking along though winding mountain roads is just exhilarating! Although I could ride a bicycle and drive a car, I had never ridden a motorbike until I came here. 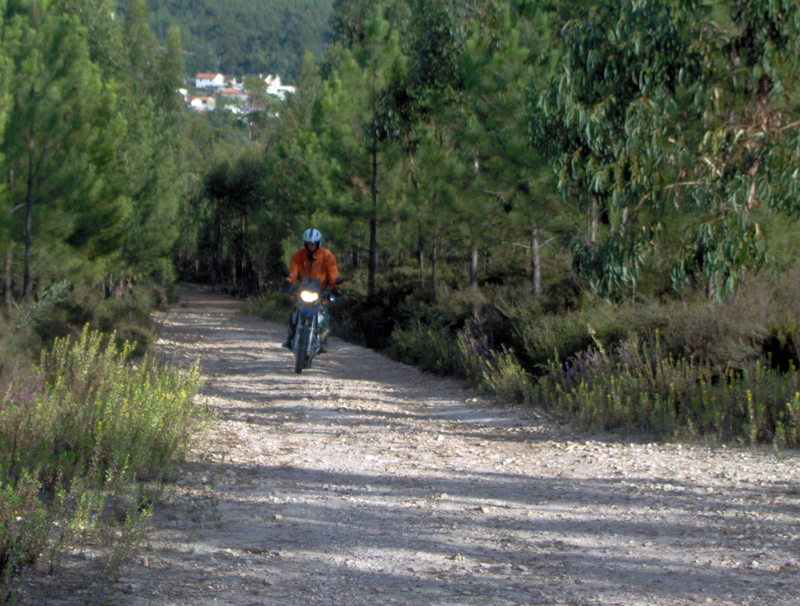 I was pleased that after a day with tuition from Geoff and practice on the tracks around the villa, on my second day I was out riding the local trails and tracks and having fun. 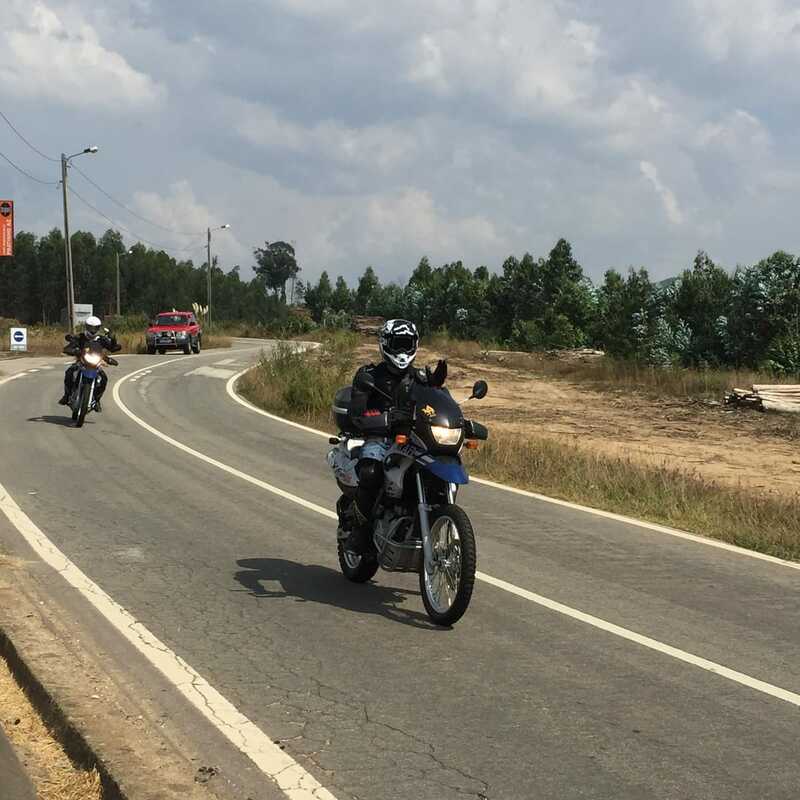 I set out to find a holiday with the intention of learning to ride a motorbike and with gentle coaching from Geoff I left having ridden muddy tracks, forest trails, mountain roads, tarmac roads and more. I certainly left keen to do more on a bike! Warm welcome- I arrived to a fully stocked cool box and bed in the back of the people carrier - for the late 2 hour trip to the villa. Geoff had guessed it had been a long journey- so made sure I would be comfortable - one of the many thoughtful gestures I experienced during my stay which went beyond the call of duty. The hosts- Geoff, Lin and the pooches felt more like family, nothing was too much trouble. Geoff knows the area inside out, experienced enough on the bike to ride at every level. He is also astute enough to easily work out what an individual may want from a trip and make it happen. He takes great pleasure from seeing people enjoy their biking and the area. So from a novice like me to an experienced rider who wants to explore some on or off road hidden Portuguese gems and improve their riding Geoff is definitely the man for the job! Lin provided delicious, nutritious meals 3 times a day, kept the fridge stocked and the pair of them were fantastic company with many great tales from their lifetime of adventures sitting by the fire with a beer. explored and even managed an end of season dip in the lake. The area is stunning with lush green mountains, sleepy villages where time has almost stood still built from local materials, open moorlands, cobbled streets away from the tourist trail. I am definitely looking forward to another visit. 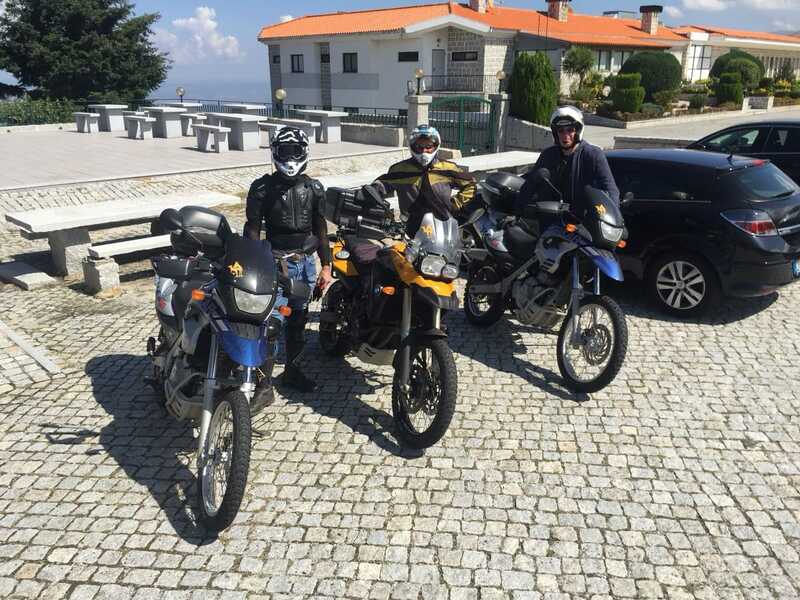 David and Sylvia Smith came for their sixth visit to enjoy riding with Geoff through the Portuguese mountains - on and off road riding. 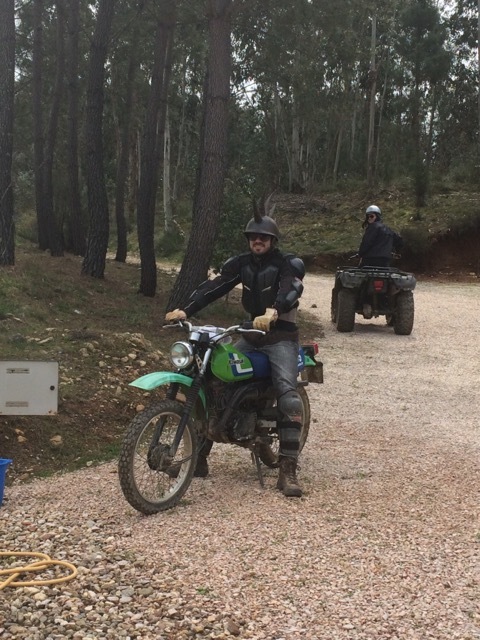 Geoff - great off road teaching and guiding through the beautiful mountains of Portugal. We can definitely do with more of that! Thank you for letting us stay with you and looking after us so very well. We have taken our motorcycles across Europe to Austria and the Czech Republic, Spain, the Pyrennees, Andorra, France and more – BUT this tops it all! Geoff took us on different rides which gave us all an experience to suit our needs. Fabulous selection of motorcycles for both on and off road. Lin looked after us well – the food each day was great. What a lovely break – not having to think at all – relaxing and having mega fun. Geoff tells us there's even better to come - pity its our last day! Our third time here - so what can we say?! We must have covered all the roads within a day's ride by now?! We love the area so much it seems we will never tire of it. Geoff doesn't seem to and is a great leader giving us fantastic days out and when we return to the villa, Lin takes over and feeds us so well. Cleo and Bobi get us up early to walk around the lake - then the sun shines all day. Seems like a dream. Catherine and Russell first visited us in 2011. This year they arrived with other members of their family. Catherine and Russell went out for some on road ride outs. Guy took advantage of improving his off road riding with the GasGas Randonne. While Emily and James "chilled out" and went off road riding with Lin's quad! 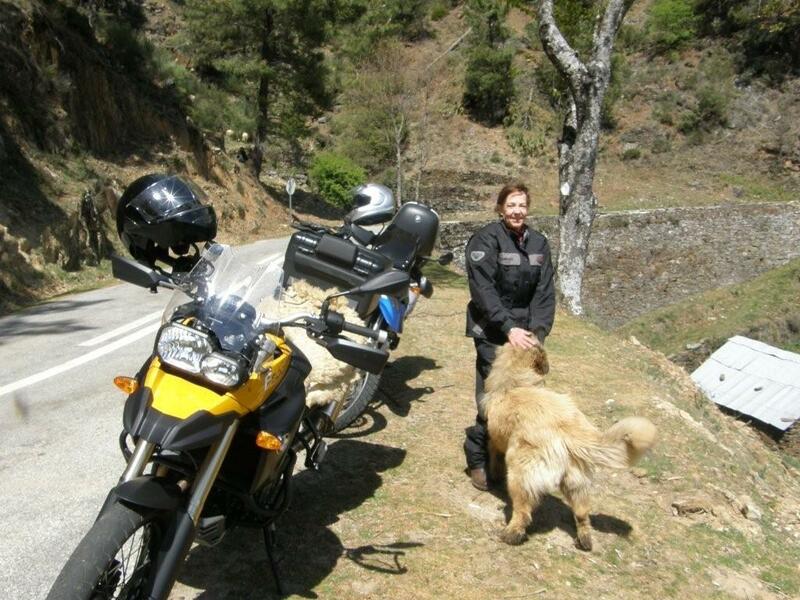 Ekaterina (Kate) first came to Portugal as a pillion rider in 2011. Geoff taught her how to ride a motorbike and she then went home to Moscow and passed her motorbike test. Since then she has bought her own motorbike, taken motocross lessons and ridden (solo) to Vienna and back from Moscow. 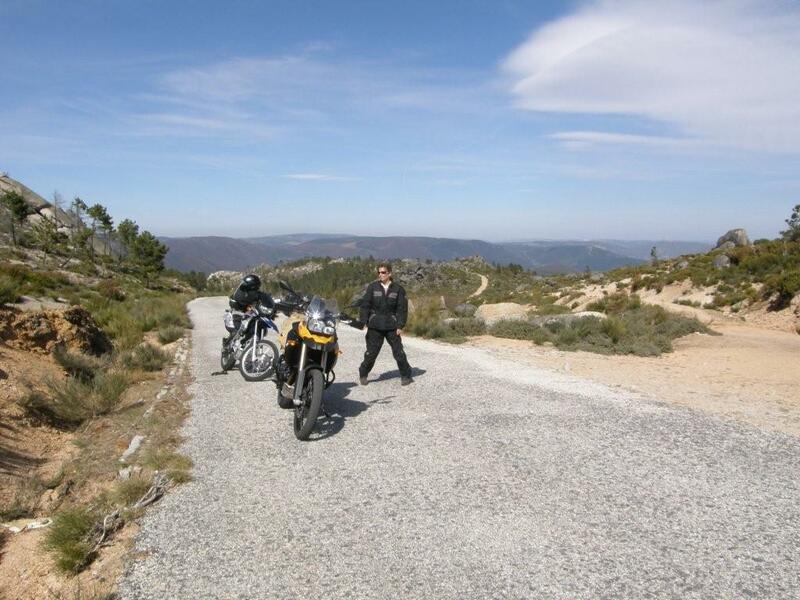 Kate returned to us in 2013 for a motorbike holiday and you can see from the smile on her face exactly what motorbiking (on and off road) in Central Portugal means to her! My friend and I came here to relax and have fun. Our week has been great – no wives to nag us – just Lin to keep us right! Geoff and Lin have made us very welcome and the bike riding has been fantastic both off road and on road. I loved all the bends and amazing views. We highly recommend this as a “chilled out” relaxing break from work. We loved the villa, we loved Lin’s cooking, we loved Geoff’s biking tours …..
A fantastic week’s holiday with slippers thrown in! The trails were awesome – going home happy, proud and aching!! This is our second visit to Thrustforth Motorcycle Holidays. Geoff and Lin are remarkable people having led a life which most people only dream about but few of us ever do. From motorhome, around half the world on a shoestring to building their remarkable house almost single handed which is almost utopia. If you enjoy your visit half as much as we have done then you are in for a great time. It’s an interesting life – world travellers on bikes – looking through the comments I see Sylvia and David came here – our paths crossed in the Pecos some years ago. 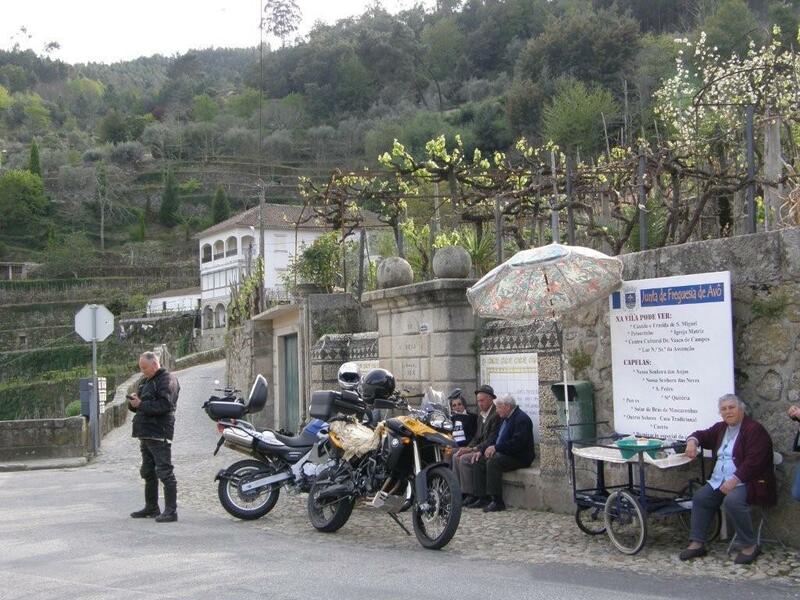 Whilst here we continued our worldwide search for the “Number 1 Nata” (Nata = Portuguese custard pastry) – Geoff immediately took up the challenge and astride his trusty BMWs we scoured Central Portugal searching out bakeries in monasteries, villages large and small, castles, swimming pool cafes even resorting to help from Donald Duck! 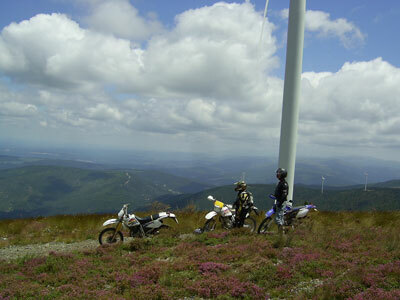 I came to Thrustforth Motorcycle Holidays looking for a “2 wheel experience” and I leave having had a wonderful time. I love a variety of challenges and Geoff was patient and knowledgeable in improving my skills for the road bikes and dirt bikes. Being able to follow Geoff’s rear tyre all day is fantastic for letting you just concentrate on the road whilst seeing rustic Portugal. Thanks to Lin for the fabulous food. 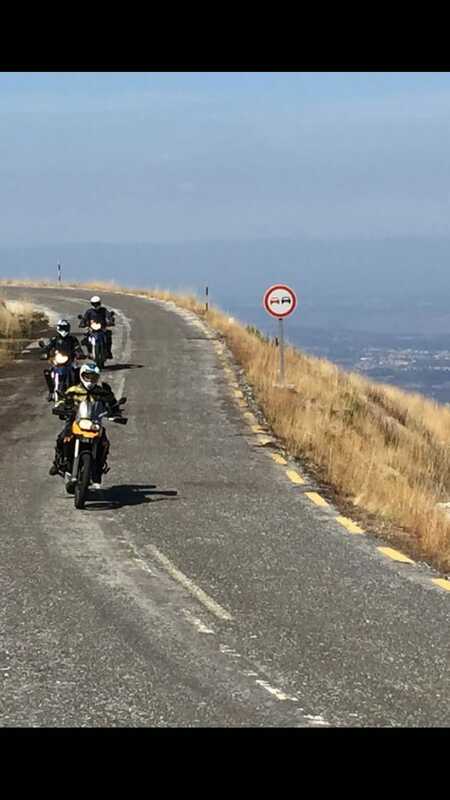 All in all, a great holiday – I’ll be recommending to other bikers. Geoff and Lin have been wonderful hosts with superb food and great company. The villa is wonderful – the views from the balcony are beautiful. The roads are great, quiet and with plenty of bends. Geoff takes you off the beaten track into little mountain villages – the choice of picnic spots was great – always by a river, stream or waterfall. I would recommend anyone come and visit Geoff and Lin whether for biking or just a holiday. 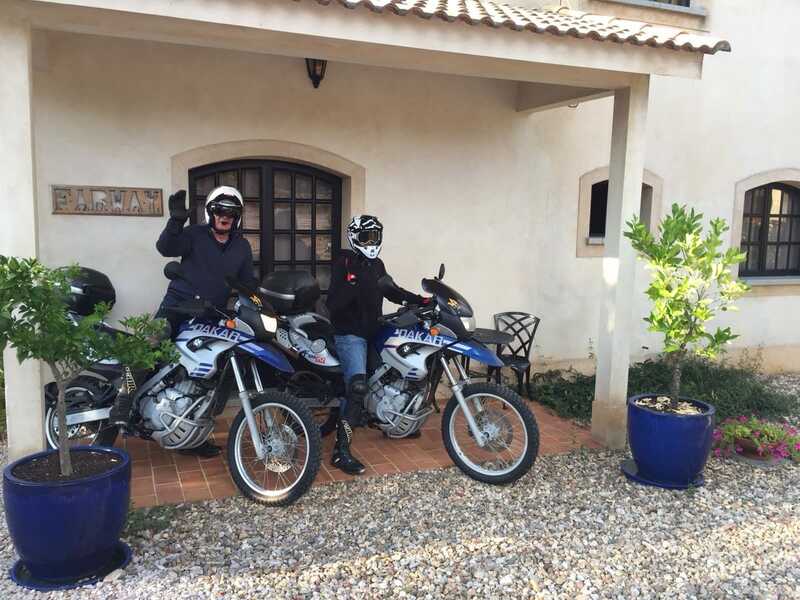 This was our second trip to Thrustforth Motorcycle Holidays/Casa da Roda and we were just as impressed with the warm hospitality, fabulous views and the breathtaking scenery as we had been on our previous trip. We had travelled up from Faro airport which was about a 5 hour journey and due to the fact that we had been travelling from the early hours of the morning we were quite fatigued, when we arrived Lin as always had a welcome pack waiting for us and also a lovely pot of tomato and lentil soup which saved us having to worry about what we were going to do about dinner that night, this was most welcomed and very thoughtful. . Unfortunately the weather wasn’t that great during our trip but didn’t stop us getting out on the tracks and trails with Geoff. 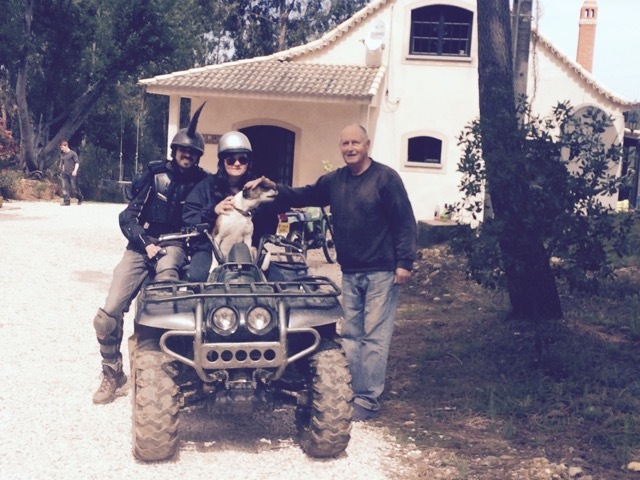 Geoff has an abundance of knowledge and experience in off roading in this area of Portugal and has quite a number of fellow off roading friends which I had the pleasure of meeting, riding and socialising with. The helpful tips and words of encouragement that both Geoff and the guys offered were well received and put into practice, although it still didn’t stop me taking Geoff out, apologies once again Geoff. . The Villa has a log burner and central heating which was great to sit in front of after a hard day on the trails. Just sitting relaxing and chatting with Geoff and Lin in the evenings in a peaceful and tranquil setting was just magical and a far cry from the rigors and stress of home. .
During our stay my wife was unwell and Lin and Geoff without hesitation made sure we got to a pharmacy to get the correct medication and also offered to take her to their local doctor, this again compounds the fact that Lin and Geoff are two very special people who really care about their guests and are always willing go that extra mile to ensure your stay is comfortable, enjoyable and truly unforgettable. .
We could write for ever on our adventures with Geoff, Lin and Casa da Roda but that would only be our experiences, so go and experience it for yourselves, I can assure you that you will not be disappointed. .
We have already booked to return in September 2012 and we are really looking forward to seeing you all again soon. .
Linda and Geoff made us both feel very welcome. The food was fantastic and the hospitality second to none. I have never ridden off road and with Geoff’s expert help, I did things on a trail bike I thought was impossible. Although I have ridden bikes for more than 30 years, following Geoff through the twisties made me realise I still have a lot to learn! We both thought the roads and scenery were amazing. This has got to be the best holiday we have ever had. It is motorbiking heaven on road and off road. 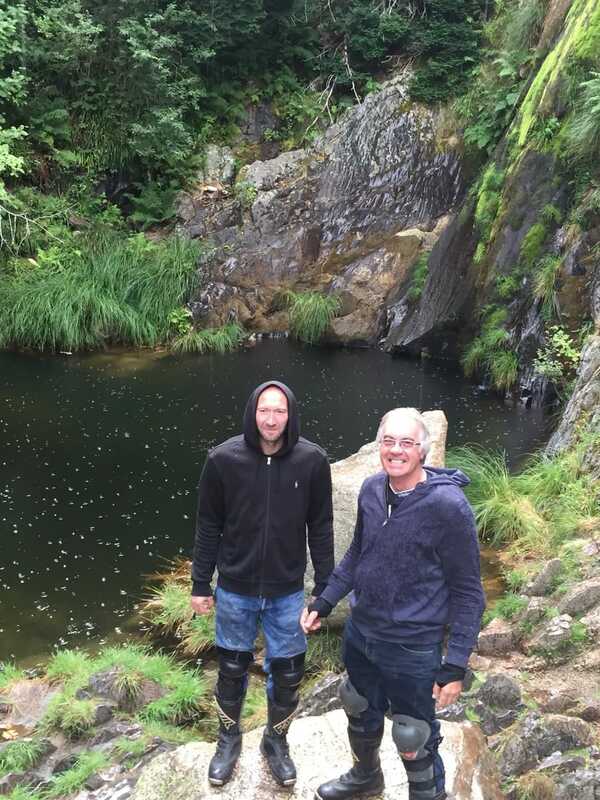 Thanks to Geoff taking us up the mountains – what an amazing time we had with all the little coffee stops – he knows them all. We also loved walking Bobi and Cleo – we will miss them greatly. Thank you so much for making our holiday a one to remember! We will recommend you to everyone.